Description: The entire Metal Gear saga is now at your fingertips! Information on characters, weapons and plot elements from Metal Gear (1987) to Metal Gear Solid® 4: Guns of the Patriots (2008), accessible from three different perspectives: an encyclopedia (GENE), a relationship map (MEME), and a timeline (SCENE). Jump from one page to another using keywords and access the information you want, when you want it. This digital supplement is a must-have for every Metal Gear fan! * Information revealed in Metal Gear Solid® 4: Guns of the Patriots cannot be viewed without a saved data file created after completing the game. This is a list of VGCollect users who have Metal Gear Solid 4 Database in their Collection. This is a list of VGCollect users who have Metal Gear Solid 4 Database in their Sell List. 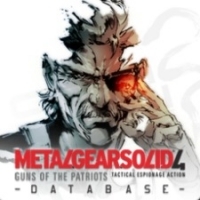 This is a list of VGCollect users who have Metal Gear Solid 4 Database in their Wish List.